Showing results for tags 'Brandy'. I was recently reading a different post from a few years back and hoped to get some info on this. A large batch of pear cider sorta feel into our lap recently (Aprx. 2,000 gal). We planned to take a similar approach to most of our apple brandy runs we have done in the past and do a two run/ strip and finish distillation. The initial pH of the cider when we received it was measured around 3.5. Our stripping runs are tasting great with a decent yield but we have noticed a definite acidity to the distillate itself (pH aprx. 2.9-3) as well as noting a general blueish hue (we have a copper condenser so no surprise there). But due to the high acidity after the stripping runs even, we are thinking of adjusting the pH of the distillate prior to our second/ finishing distillation. Should pH adjustment be happening prior to stripping runs? Premium unaged California Brandy / Grape Spirit Available! We are having a problem which has left me scratching my head a bit. The fores, heads, and early parts of the heart are coming over with a pale greenish/yellow tint. It starts most intense at the heads and generally lessens as the run goes on. It looks different than the copper contamination I've seen from other stills, there isn't any blueish and shades more towards yellow. We've done 6 distillations of wine and it has happened the same way each time. We are distilling a 14% abv red wine made from Syrah, the wine has no added SO2 and doesn't present as flawed (no obvious VA,brett, infections). Wine pH is ~3.8 We are running a 4 plate Kothe still; it has a copper boiler, stainless column with copper plates and dephleg, and a stainless steel condenser. The lyne arm to condenser is stainless and has an upward J, so liquid generally drains back to dephleg and not condenser. It is heated very slowly via bain marie and no wine generally boils/foams into the plates. We generally distill brandy in a single pass, using the plates and dephleg with a heads cut from 182 to 175, adjust dephleg down and a hearts cut 165-145. The still is cleaned with 80C water after every distillation and receives a citric acid rinse generally when we switch between products or the copper is looking tired. We've distilled probably 300+ runs of wine on this still without encountering this. I've tried degassing the wine to remove co2, which didn't change anything. I gave the still a through cleaning & citric acid treatment, as well as dissembling the lyne arm to look for corrosion or debris but it looked clean. Adding baking soda to the diluted greenish fraction doesn't alter the color, but after a period of time it appears some of the green drops out and the fraction is clearer when decanted. Today I am going to redistill the greenish portion as well as try filtering it through a .25 micron filter to see what happens but I would appreciate some theories on what's going on. I was informed that in California, distilleries can produce spirit for wineries and if those spirits (brandy and pomace brandy) are produced from the winery's grapes the spirits can be sold by the winery under their tasting license. Does anyone have experience with this? Can you point me to the state laws related to it? One place I distill is a small Oregon brandy distillery, and it would be a lot of fun for us if something similar could get passed in Oregon. I am hopeful that seeing a framework operating someplace else might give us a starting point. Hi all, we are distilling cider that was fermented by a local cidery. The cider was made from mostly cultivars (not sure which). It was chapped up to around 18 Brix with sugar and fermented dry using a fruit wine yeast (Scott Lab V1116). No pectic enzyme was used. I'm getting an enormous heads cut, and there is an aggressive headsy astringency pervasive throughout the entire run (pinches the nose). The cider was stripped and then run through a pot with a partial dephlegmeter (Slightly open). The charge was 319 Wine Gallons at 99.63 proof. Thoughts on roughly what I can expect to collect as heads? Hello everyone, I have two books which have served their purpose. 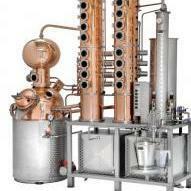 Traditional Distillation: Art and Passion by Hubert G.R. - if you want to know both the approach and attitude of Cognac distillers, this is both a novel read and a good reference. Distilling Fruit Brandy by Josef Pischl - This is a much more technical, straightforward, less "flowery" book by a German experienced in schaps production. He goes into precise detail about sourcing good quality fruit, fine-tuning a dephlegmator, etc. I am selling for $15 each. They will be shipping from an address in Canada and the shipping cost will be calculated when an address is provided. It is worth mentioning, that the Canadian dollar is currently 80% of the USD. Please DM if interested! I have a question about labeling regarding pomace brandy that may have come up for some of your before. I understand that if you're aging it for less than 2 years, that a statement of age is required on the label. But if it isn't aged at all, would it simply be considered a grappa instead, and not require any statement of age? I want to label our bottle as a pomace or marc brandy, not a grappa. The guidance is somewhat vague to my reading. What is the appropriate labeling on an unaged pomace brandy? has anybody came across an armagnac still being produced? Anyone have experience using one? I am in search of small used rum or brandy barrels to age stouts. Prefer 15 gallon, but would take 5 gal - 30 gal. Thanks. Hello All, We have recently started bottling our Grappa Brandy, it has been aging in barrels for two years and we are seeing some sediment in the bottle after it has been chilled. Does any one have any idea what this is and how we could remove it? We have been thinking about cold filtering the Grappa before bottling to see if that would help. Any help or suggestions would be appreciated!